LPDA-A0097 antenna is constructed using patented wire antenna technology. This makes the antenna lightweight and allows for very compact storage, quick, easy deployment and mounting. The flexible wire elements make it easy to collapse the antenna and break off any accumulated ice. 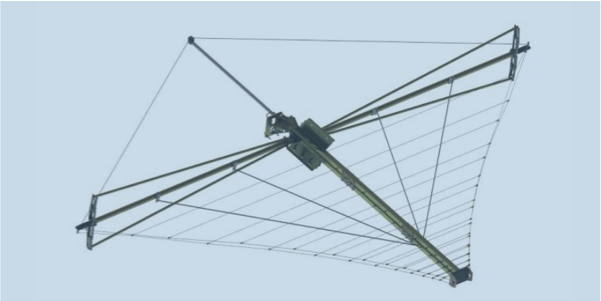 All antenna elements are permanently attached to the boom, to prevent any parts from becoming lost in the field. Version -01 adds a center of mass mounting bracket, allowing for attachment to lighter masts. Version -05 is a more collapsible version that reduces the length of the stowed antenna assembly (minimum order quantity may apply).